Where is marine litter concentrated, and which species and ecosystems does it affect? Researchers at the Alfred Wegener Institute have for the first time compiled all scientific data published on marine litter in a single, comprehensive database, now accessible from the online portal AWI Litterbase. Here, both the distribution of litter and its interactions with organisms are presented in global maps. In addition, the regularly updated datasets are fed into graphic analyses, which show e.g. that seabirds and fish are particularly affected by litter. The latest interaction analysis shows that 34 per cent of the species monitored ingest litter, 31 per cent colonise it, and 30 per cent get entangled or otherwise trapped in it (for all figures: valid as of 23 March 2017). The total number of affected species is rising steadily and is currently at 1,220 - more than twice the number reported in the last review article. These numbers will change as the database is being updated regularly. "In AWI Litterbase we've for the first time analysed all groups of organisms, which were studied in connection with litter, and presented in map form," says Dr Melanie Bergmann from the Alfred Wegener Institute, Helmholtz Centre for Polar and Marine Research (AWI). The biologist has been researching deep-sea litter for several years, and developed the AWI Litterbase together with her colleagues Dr Lars Gutow and Mine Tekman. The team's motivation: previous compilations of scientific data never included all datasets, because there were too many differences in the methods applied by the various research groups. "Our global maps also show data in different units. However, we intentionally designed Litterbase with this feature, since it allows users to filter results by type of unit. In this way, values using the same unit can easily be compared -for the first time, for litter in different regions and ecosystems," explains Lars Gutow, highlighting one of the database's central features. "At the same time, Litterbase is also of tremendous scientific value. 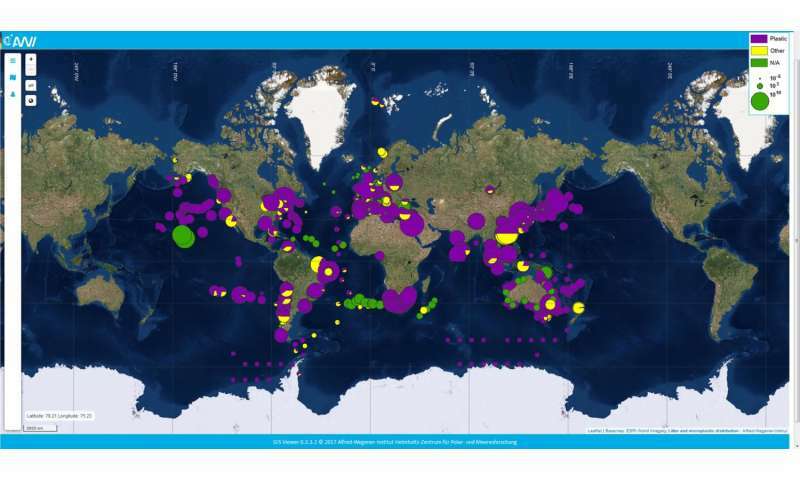 Our database will allow us to assess and better understand the global quantities and distribution patterns of litter in the ocean." According to Bergmann, "The maps document where researchers have identified litter. But it's important to bear in mind that the blank areas of the map don't necessarily represent clean regions; instead they're blind spots." This information, too, is extremely valuable and helps identify areas where research efforts need to be intensified. For example, it's readily apparent on the global map that numerous studies have been conducted in the Mediterranean; they indicate that this is one of the most polluted regions in the world in this regard. Yet there have been very few publications from Africa, the open ocean or the Dead Sea, so we still know precious little about the situation in vast expanses of the world's oceans. In the course of their literature research, Gutow, Tekman and Bergmann were surprised by the variety of sources where marine litter was described. As the team recalls: "Some litter sightings can be found in publications that actually have nothing to do with litter, like papers on the coral gardens of the Mediterranean or the anthropogenic effects that activities like fishing have on the seafloor." And Melanie Bergmann adds: "While compiling Litterbase, I discovered a cache of old data on litter in the Antarctic, which the signatory countries of the Antarctic Treaty gathered on a regular basis. In addition, the ingestion of microplastic at the beginning of the food chain was investigated for various groups of plankton and unicellular organisms as far back as the 1980s. As such, Litterbase will also help us rediscover 'old' and in some cases forgotten findings." For government authorities, politicians and journalists, not to mention teachers and students, both Gutow and Bergmann are much sought-after experts. The database's analysis tools allow all of these groups to create global estimates of which animal groups are reportedly hardest hit by marine litter, and what the litter consists of in different ecosystems. Further, all of the scientific literature used to create the Litterbase is also linked, helping interested users to pursue research of their own. AWI Litterbase is sponsored by the Helmholtz Association's Earth System Knowledge Platform (ESKP), where the eight Helmholtz Centres from the research field Earth and Environment pool their expertise to convey the interconnections between environmental hazards, climate change and pollutants.